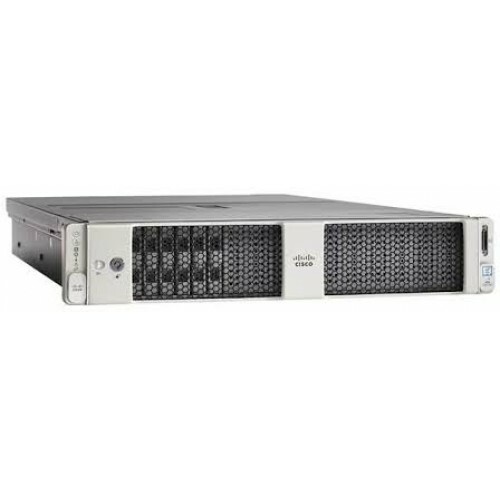 Cisco UCS-C240-M5S 2RU rack server (8Core) With 2x Intel Xeon Silver 2.1 GHz 4110/85W 8C/11MB Cache/DDR4 2400MHz. Chassis with Up to 8 SFF + 2 rear drives for 2CPU Configuration. It has 2x 32GB DDR4-2666-MHz RDIMM/PC4-21300/dual rank/x4/1.2v and 4x 1.2 TB 12G SAS 10K RPM SFF HDD.Cisco 12G Modular RAID controller with 2GB cache.Cisco UCS 770W AC Power Supply for Rack Server Dual. Remote Management IMC SW (Recommended) latest release for C-Series Servers.. Power Cord Jumper, C13-C14 Connectors, 2 Meter Length. Dual 10GBASE-T Intel x550 Ethernet ports. Intel i350 Quad Port 1Gb Adapter. Ball Bearing Rail Kit for C220 & C240 M4 & M5 rack servers. Media Drive (DVD) for C240 M5 Servers (8 HDD version only).